Update [2006-4-17 16:2:1 by Dave]: From Reuters Chad eases threats on oil, Darfur refugees. "Chad on Monday softened threats to stop sheltering Sudanese refugees and halt oil production following rebel attacks as the United States offered to broker a solution to a dispute with the World Bank." This is the first in a series of posts I hope to complete about oil-related conflicts in regions of the world that TOD does not often pay sufficient attention to. Viewing geopolitics through the lens of oil is not always right, but as Michael Klare's book Blood And Oil makes clear, there is often a connection. A good case can be laid out that Chad and the Sudan are in turmoil right now over oil and who controls it. Another case can be laid out that the cause of the Genocide in Darfur has it's root causes not only in ancient ethnic/tribal and religious rivalries that have been going on since Sudan's independence in the 1950's, but also has most recently been exacerbated in disputes over who will control the oil in the regions. This genocide is being carried out by the Janjaweed militias supported by the Sunni Muslim government of Sudan based in Khartoum against the Christian and indigenous Africans of the Darfur provinces. First, we'll start with a map of the region to get everyone situated. In this post we'll analyze the situation in some of its aspects but particularly from the perspective oil production. Perhaps many of you think this issue not important. I hope to persuade you that this tragic situation is illustrative of our global geopolitical future. So, let's look at recent developments in Eastern Africa. Perhaps this quote from David Morse's War of the Future: Oil Drives the Genocide in Darfur will persuade you that these issues are worth thinking about. With the signing of the treaty last January, and the prospect of stability for most of war-torn Sudan, new seismographic studies were undertaken by foreign oil companies in April. These studies had the effect of doubling Sudan's estimated oil reserves, bringing them to at least 563 million barrels. They could yield substantially more. Khartoum claims the amount could total as much as 5 billion barrels. That's still a pittance compared to the 674 billion barrels of proven oil reserves possessed by the six Persian Gulf countries -- Saudi Arabia, Iraq, the United Arab Emirates, Kuwait, Iran, and Qatar. The very modesty of Sudan's reserves speaks volumes to the desperation with which industrial nations are grasping for alternative sources of oil. And what can we say about Southern Darfur? You guessed it--oil has been discovered in the region. From the Sudan Watch blog. KHARTOUM, Sudan -- Sudan said Saturday initial oil drilling operations in the troubled Darfur region indicate there is abundant oil in the area. Sudan Energy Minister Awad al-Jaz told reporters in Khartoum an oil field was found in southern Darfur and it is expected to produce 500,000 barrels of oil per day by August. Most of the country's oil production comes from oil fields in southern Sudan, where a peace treaty was recently signed between the government and rebels. Renewed fighting broke out at the very moment when a peace agreement was about to be signed which would have ended 21 years of conflict between the government of Sudan, and the Sudan People's Liberation Army (SPLA) in southern Sudan. Darfur's tribes rebelled against the government complaining that the Sudan government had failed to develop the area. It is alleged that the rebels, aware of the terms of the proposed peace agreement between the government of Sudan and the SPLA, hoped to strike a favorable deal for themselves. Southern Darfur, like southern Sudan, is rich in oil. 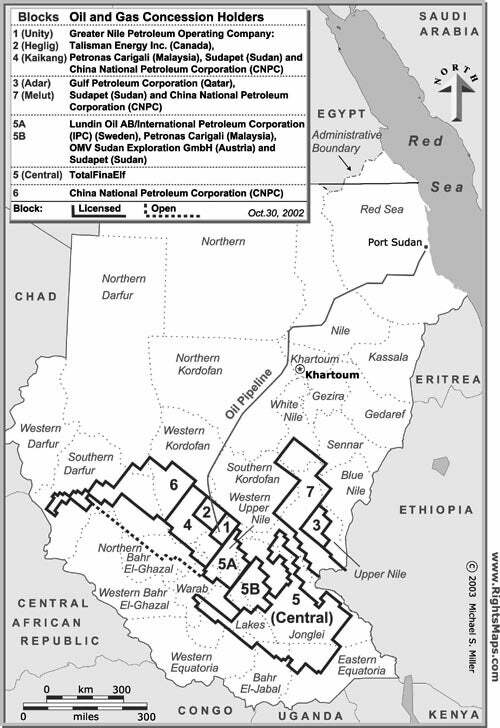 The Chinese National Petroleum Corporation holds the large oil concession in southern Darfur. Chinese soldiers are alleged to be protecting Chinese oil interests. I recommend this article since it gives some background to the Darfur conflict and some references. I couldn't possibly cover all the details of civil war there in the short space I have here. for oil contracts with Sudan. Here's a map of oil concessions in Sudan from Human Rights Watch. So, as you can see, the oil blocks are there, the pipeline is in place and the genocide in Darfur is no deterrent to doing business. But let's turn to Chad and then bring recent events into focus using our oil lens for understanding geopolitical events. The CBS News story Chad Threatens To Cut Off Oil Pipeline brings us up to date. In January, the World Bank froze an escrow account with $125 million in oil royalties in London, [Chad's Oil Minister Mahmat Hassan] Nasser said. It also cut $124 million in financial assistance after Chad changed an oil revenue law passed in 1999 as a condition for the World Bank's support for the pipeline. Nasser said the funds must either be released or the operators of the pipeline must compensate the Chadian government. The law required two-thirds of oil revenues to go toward improving living standards in one of the world's poorest countries. It also required 10 percent of proceeds to go into a savings fund to be used when Chad's oil reserves are exhausted. But the National Assembly amended the law in December. It doubled the money going to the government's general budget, freed money in the savings fund and added security — buying arms and equipment for the military and other security forces — to the programs that received over two-thirds of the royalties. Nasser said Chadian officials met twice with World Bank representatives seeking to unfreeze the funds, but without success. He said that without payment, the government would have to shut down the pipeline, which flows through Cameroon to the Atlantic Ocean. Here's how the oil flows--"Chad's oil exports — 160,000 barrels per day — are small by international standards and have a high sulfur content, reducing their value." Stuart called our attention to a Washington Post story Chad Threatens to Cut Off Oil Pipeline from which we learn that "... an Exxon Mobil-led consortium exported 133 million barrels of oil from Chad between October 2003 and December 2005" using this pipeline and further that this consortium paid $4.2 billion to build it. The president of Chad, Idriss Deby, is an "elected leader" but of course he is a despot running a kleptocracy--hence the dispute with the World Bank and the change of law enacted by Chad's National Assembly mentioned in the previous quote, which Deby controls. Read the CBS article and Chad set for oil production debut (2002 from the BBC) for some background. So, how do Sudan, Chad, oil and genocide all connect up with each other? As we find out from Chad cuts diplomatic ties with Sudan (sorry, long quote--but this sums it up very nicely). Well there's been rebel activity on the border between Chad and Sudan for about the last six months, and the [Chadian] rebels have gradually been advancing on the capital, N'Djamena. And they reached the capital this week, or the outskirts at least, and started attacking there. The rebels are the United Front for Change and they're a loose grouping of eight anti-government groups, and the Chadian Government believes, basically, that they're being funded and armed by the Government of neighbouring Sudan. They've been basing themselves in Darfur. And so for that reason the President of Chad has now said he'll cut all diplomatic ties with Sudan and is also threatening to actually evict all the Sudanese refugees who are living on the Chadian side of the Sudanese border. Unfortunately there are about 200,000 refugees along the border between Chad and Sudan on the Chad side. Obviously they're people who fled the conflict in Sudan's western region of Darfur. Now there's already two to three million displaced people in Darfur itself; the situation is worsening inside Darfur and has been for about the last six months. Agencies there already can't cope, there are about 14,000 aid workers. They can't get aid to people because of the worsening conflict because of hijacking of trucks of food, that type of thing. So any move to move those refugees on the Chadian side back into Darfur would be absolutely disastrous. Reading further, we find that the United Front for Change believe Debi is corrupt (he is) and since Chad is an "oil-rich country" (that's debatable), "They're essentially saying that the President's been skimming that oil revenue. They're also calling him a dictator and ... they're making no secret of the fact that they want to overthrow him." So, the entire situation only makes sense through the lens of oil and who controls it. I'll finish off by giving you the EIA data from both countries. From the Cameroon and Chad EIA data. All together, folks, that looks like about 610/kbpd (that's thousand barrels a day) of production from Cameroon, Chad and the Sudan. Yet, consider the situation there, the killing, the chaos, the starvation, the corruption, the disease, the suffering. And why? Because Oil Is King. Blood and Oil. Further information can be found from any of the sources I cite. This concludes my report in what I hope will be a continuing series on geopolitical hotspots in the world related to energy and the riches and ruin it can bring. I have posted articles on Zimbabwe and other African countries for about 3 years on the Yahoo forums. Glad to see it officially started here on TOD. I believe Africa can be the first continental-sized 'canary' we can watch to see how things will go elsewhere as we hurtle postPeak. Consider if all the money spent on African weaponry was instead wisely spent on building a sustainable biosolar lifestyle and voluntary population control through education. Picture Africa with all kinds of solar panels and windmills spinning across the Serengeti Plains or massive permiculture efforts in the Nile Valley and elsewhere. Huge animal parks where the now severely threatened species would not be poached or forced into ever smaller spaces. My feeling is that Richard Duncan's Olduvai Theory will be first confirmed in Africa, possibly in Tanzania itself-- home to the real Olduvai Gorge. Corruption by detritus, and overpopulation by ignorance are really going to hammer Africa. Global Warming is predicted to amplify this hammer into a piledriver. Sad. What makes you think the average Tanzanian will even notice peak oil ? Unless Tanzania is a large net food importer (something I doubt they can afford) I suspect they may remain quite unscathed - the country is pretty much unindustralised as far as I can remember - most of the roads are barely passable by your average vehicle - and the locals by and large get by on a subsistance agriculture economy - kind of a twisted version of a relocalisationist's vision of the future (but with a lot of malnutrition and disease). As an aside, I've got to say that I like Tanzanians - the country seems to have a hierarchy based on height - on entering the country I found myself at the back of a queue of maybe 500 people waiting for processing by the immigration officials. I immediately found myself hauled up to the counter (wondering frantically what offence I'd caused), had my passport stamped rapidly and was sent on my way - the most emphatic queue jumping I've ever performed. That sort of thing happened repeatedly - even out in the middle of nowhere tribal chiefs would make a beeline for me to shake my hand and congratulate on my noble bearing (in their limited vocabulary). They might notice more than you think. DAR ES SALAAM, April 16 -- Prices at filling stations in Dar es Salaam have gone up over the weekend, after the price of crude hit 67 U.S. dollars a barrel on the international market. Unleaded petrol is now selling at 1,260 Tanzanian shillings (1.024 dollars) per liter while diesel is selling at 1,256 shillings (1.021 dollars) per liter. ...Local analysts attributed the fuel price hike to threats posed by Iran's nuclear standoff with the United States and the violence in the African oil-producing country of Nigeria. They also predicted that the country's inflation was set to rise further in that fuel prices would affect the transportation and distribution of food in the country and fuel prices themselves,just like the food prices, also weigh heavily on the inflation scale. Thanks for the link - as with elsewhere in the really poor parts of the world, the urbanised part of the Tanzanian population is no doubt getting severely squeezed by rising fuel prices. The Tanzania I'm thinking of largely consists of people who don't consume oil at all though - no fertiliser, no pesticides, no transport - maybe some cooking oil if they are a bit luckier than most - it really is one of the poorest places on the planet. If these people are dependent on food aid to get by (and I'm not sure they are) then maybe that segment of the population (and its a large one) may notice peak oil - but I think the only thing they'll notice is fewer vehicles driving through the areas they live in. Thxs for responding. Never been to Africa, just googling whatever info I can. Everybody will be affected by Peakoil to some degree. True, many Africans use none to very little detritus, but eventually they won't even be able to afford metal for hoes, shovels, or machetes. The inevitable decline of complexity will reach every societal level. "True, many Africans use none to very little detritus, but eventually they won't even be able to afford metal for hoes, shovels, or machetes. " Some of the people I'm thinking of are already at that level. At the risk of boring everyone with my anecdotes this reminds me of a rafting trip I did down the Zambezi once. The river guides took along a small packet of fish hooks with them, which I vaguely assumed they intended to fish with. It turns out they were actually for a trading - as you got out into the Zambian boondocks the locals never saw anything metallic - and a fishhook was considered a valuable item - so they'd trade quite a lot of their agricultural produce for a single hook (presumably they also traded for fishing line), which made some of the rafters very happy. An interesting post, thank you, Dave. I would just like to caution against the 'uncritical' use of the very emotive concept of 'genocide.' It's a word that, in my opinion, is being overused and is losing it's value, and if any word needs doesn't need this it's genocide. I think what you meant to say was that the world does not need genocide--no matter what word is used to describe the mass killing of one ethnic group by another, as is now happening in Darfur. Genocide, however, is common in history rather than exceptional, regardless of what name it goes by. Notice that when it is a case of Arabs killing Blacks, there is little outcry. This "genocide of blacks by Arabs" is a propagandist invention by US warmongers to distract attention from their anti-black racism and stoke anti-Arab racism. Those who have investigated the conflict in Darfur themselves report that the sides are ethnically indistinguishable. Oh, really? And how many Black African refugees do you know? Ask the relatives of the victims what is going on. What if we find different victims who have suffered at different hands? Or will you choose your victims more carefully than that? The arab apologists jimvj and smekhovo are skewing the argument. When Europe and the US want to bring Sudan to the Security Council, do you know which are the only countries opposing it? The arab countires. They instead blame the Rebels even when it is well documented that the janjaweed are supported by saudi arabian funds and arab arms. juan cole is a extremist islamic supporter. If you read what he writes, it wouldn't take 5 minutes to understand that. Quoting him in the support of your argument is like quoting saudi arabia's interior minister that saudi arabia is not supporting terrorism. In other words: nobody believes you. As stated earlier, juan cole and these arab apologists manage to bring in Zionism as the main factor of their discontent in sudan. You have quoted juan cole's Zionism paragraph. Can you EXPLAIN how the hell does Zionism tie in with the sudan matter? jimvj: If you depend on photos to distinguish Sudanese rebels and the janjaweed, you're basically too naieve to understand or comment in this matter. Did you read the article that Dave linked to in this post? Chances are that you did not. Eventhough he quotes from that article right in his post, you choose to ignore it. The article he quotes shreds your "opinion". Ignoring facts to support your argument is detrimental to your post. No, I actually said what I meant to say. The following is just an outline. I don't think it's necessary to go into enormous detail about Sudan and it's history, problems and ethnic and social complexity, but I'm going to give an outline, so please forgive me if it's a bit superficial. If any of you are really interested, go and read some stuff about Sudan! First, I am not denying that violence, ethinic strife, something close to civil war and massacres have occured in and are occuring in Sudan. It's the scale and nature of the violence that concerns me. I don't believe there is strong evidence of 'genocide' in Sudan. Saddam was also called Hitler and Iraq was supposed to be full of mass graves, like the weapons of mass detruction, they were never actually found. Sure one found what appeared to be war graves with dead Iranian soldiers, but not the mass graves we were told about. It was war propaganda. I'll give rough definition of the term 'genocide.' The systematic and centrally co-ordinated, racial motivated, attempt by one ethnic group to irradicate, wipe out, or actually exterminate another ethnic group. Thankfully, this doesn't actually happen very often. Even the mass killings in Rwanda, may not really be definable as 'genocide' because it's debatable whether these ethnic differences really have a proper foundation in Rwanda. Supposedly during the colonial period the Belgians casually devided people into two groups, based on their relative heights! I'm not sure how much I really want to get into this kind of argument about what's happening in Sudan and whether or not 'genocide' is actually taking place or not. I think what's happening there is bad enough. I just don't think it qulifies as 'genocide.' Why can't we keep the word genocide for genocide. I think the word loses value if we use it to describe ethnic violence which isn't really genocide. If we accept this broad definition of 'genocide' then I think one can argue with equal force that the United States has been guilty of 'genocide' in Iraq, indeed some people do argue this and forcefully. What you write about 'Arabs killing Blacks' is also very problematic in relation to Sudan. But it serves another purpose entirely. I'm not really sure if your aware of this though. Maybe your just pissed at me for some reason? I have real problems with this whole 'race' question. I think it's a very dangerous and questionable and controversial area. For example, 'everyone' in Sudan is 'Black'. There is only one 'racial group in Sudan and their all 'Black'. The term 'Arab' is also interesting. Are there really 'Arabs' in Sudan? There are Muslims who are 'Black' and 'Blacks' who are Christians and 'Blacks' who worship nature, so what? How relevant are these social divisons in reality? It gives the impression that the 'Arabs' are killing the 'Blacks' because they are 'Black' and that the socalled 'Arabs' are rascists, and therefore genocide is taking place. This 'loose' use of terminology is tendentious. It's a form of spin. You, Don, or I, wouldn't be able to see the difference between the main ethnic groups in Sudan. The situation in Sudan is more complex than we learn from most Western media. The 'problem' with Sudan is not the killing. In the Congo somewhere around two to three million people have been killed during the last five or six years, and we hear very little about this far bigger civil war. The 'problem' with Sudan is their oil, they may have a lot of it, the Chinese are there and we are not, and it's country with a Muslim regime which is anti-western. I know this sounds cynical and sceptical. I think given the documented history of Western 'humanitarian interventions' we should be very sceptical of everything we hear about foreign countries who've got a bit of oil and who aren't in our pockets. Just start from the premise that most of what one hears is over-simplified and grossly distorted propaganda. Then one can very slowly let oneself be convinced by cogent arguments and documentation. I think cynicism and scepticism are reasonable attitudes to adopt. Lying, double-standards, and hypocracy are about par for the course in our part of the world. I personally know a substantial number of Black African refugees. How many do you know by name--and number of relatives killed? Did you in fact assert that there were no massacres by Serbian forces in the former Yugoslavia? Did you actually make that assertion? Or would you prefer to back off? Serbian forces in the Balkan wars did not commit more crimes than Croatian, Bosniak or Albanian ones, and to accuse them of genocide is to display contempt for the meaning of words. Thank you for making your position abundantly clear. I second to that. What the "bad guys" are doing, is of course a genocide. If it is done by the "good guys" it is... what? Resistance? If you read my post carefully, you will see that I accused none of the sides in the Balkan wars of genocide. Don, I'm not sure if both of the above posts were meant for me? I'll try to quickly answer both of them though. I'm not sue what the relevance of your first post is. You know some Africans, I know some Aficans, so what? Are you saying that I'm denying that Serbs carried out massacres in the former Yougoslavia? No, I am not saying that and I did not say or imply that. All I said was that the stories about large scale slaughter and massacres and even genocide in Kosovo by the Serbian army or irregulars, the causus beli for the intervention and bombing campaign by NATO, is a very contentious issue indeed. The actually evidence that massacres took place in Kosovo or ethnic cleansing is slim to the point of being non-existant. In the West we have a habit or pattern of demonising our enemies and we continually brand them as demons or Nazis and their leaders are Hitler, and their soldiers are the Nazi hordes and they are always commiting genocide. This is the way we justisfy our wars. Yet it's usually our 'good side' that actually does the most killing, because our weapons and armies are so much better than theirs. You seem to have a rather emotional attitude to these kind of conflicts. I can understand that. The word genocide is very emotive. I just happen to think it's misplaced and misplaced for a specific reason - as propaganda to justify war and 'outlaw' those we're fighting against. Personally, I'm against war, all wars, even our 'good wars' for 'peace' and 'humanity'. It's funny or strange, how when our side kills civilians, it's always some kind of accident and we're sorry when it happens. We killed over three thousand Serb civilians during the NATO bombing campaign and destroyed an awful lot of infrastructure too. Now, most of the Serbs who lived in Kosovo are gone, as are mosts of the chruches and monastaries. We facilitated ethinic cleansing in Kosovo and handed the province over to the Albanians. Finally, the break up of Yogoslavia was a bloody civil war and atrocities and masssacres were committed on all sides. There were no 'good' killers and 'bad' killers, only killers. I think the term "ethnic cleansing" is appropriate here. It's a very strong term already, and unambiguously accurate in the Darfur context. It was popularised by the Bosnia conflict, in which genetically indistinguishable intermingled populations were perpetrators and victims of massacres and expulsions based on belonging to one or another cultural/religious tradition. Note that they all spoke the same language. In the Darfur case, the distinguishing characteristic is not race or religion, but language. That is a clear enough marker of ethnic distinction, and reinforced by the fact that one of the parties self-identifies as Arab. Excellent report. Great graphics. I wish there was a good image of Africa that just showed central Africa from coast to coast. I couldn't find one quickly. But this whole Camaroon, Chad, Sudan axis really gives you a sense of how big the continent is and how much oil there is all over at least the northern half of the continent. Anybody know what percentage of the world's oil is under Africa? How long have Chad and Sudan had border conflict? Seems like forever. I've heard that thing about the Chinese troops before recently somewhere. I wonder if anybody can verify it. Chad border, waiting for the invitation. Poland and China, missiles from Iran'. might stop for a moment and think. Here is another article on the conflict, from Wayne Madsen. Background: Wayne Madsen is ex NSA, for whatever that is worth. One suspects he would be back in the agency in a flash if there is ever regime change in the US, and that is supposing he actually left the agency rather than doing the blog as an assignment. Anyway, Wayne Madsen has a blog that gives voice to disgruntled spooks who want to leak stuff, usually anti neocon stuff. Unfortunately, this also makes the blog a excellent site for fake leaks. I have caught Wayne posting something I knew from personal knowledge to be false and I chastised him for it, but he left it up on the blog anyway. So reader beware, just as you would read the major media with skepticism. However the Wolfowitz-World Bank angle on Sudan/Chad is factual and interesting. > indigenous Africans of the Darfur provinces. He's confusing two internal problems in Sudan. Check the maps & compare the one showing where Darfur is to the one showing the distribution of oil concessions. Firstly, there's a 20-year or so old conflict between Khartoum & the south. This is the one between a Muslim government on the one hand and Christian & animist rebels on the other. They signed a deal last year, only to have the leader of the southern rebels die in an air accident within a month. 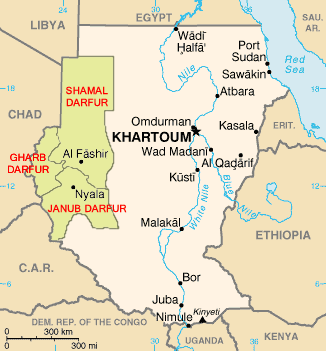 The Darfur people, in the west of Sudan, are just as Muslim and just as Arab as the Khartoum government. The conflict there is one between a nomadic pastoral and a settled agricultural lifestyle, which has spilled over into violence because of drought & desertification. Why the Khartoum government decided to arm one side, however, can only be assessed by a detailed examination of the situation - something that is beyond my knowledge. It wouldn't surprise me if oil was connected, but there doesn't seem to be an overlap between Darfur & the oil regions of Sudan. Same old story, been going on for 500 years: Arab Muslims are killing and enslaving Black Africans. Nothing new there, except that oil adds an extra motive. I agree, I oversimplified the situation. My statement reflects part of the truth but is true nonetheless. I found statements like this while researching the story. Now, on the use of the word genocide. The Clinton administration (and now Bush) went round and round characterizing various situations as perhaps examples of ethnic cleansing or civil war, as in Bosnia. To me, when one group systematically carries out attacks and wipes out non-combatants belonging to another group based on whatever perceived differences, as is the case in Darfur, then that is genocide. I refuse to make these fine distinctions. This is my first post after lurking from the beginning of this site. I feel I must respond to those who challenge the use of the term "genocide" to descibe the actions of the state sponsored janjaweed militias in Darfur. While it is true that both groups are Muslim (unlike the civil war in the south that targeted Christian and Animist tribes) there is a definite tribal distinction between the groups. There is also an environmental component. The Darfurian tribes are agricultually based while the Janjaweed are from herding tribes. Due to desertification, the herding groups have lost food supply for herds and are seeking to move into formerly agricultural areas. When a government targets people, not for what they have done, but because of who they are, it viloates international law. Under the current circumstances, what is occuring in Darfur is genocide. The law quoted is absurd. Anything could be condemned, or anything excused, according to convenience on the basis of such imprecise formulae. The claims of genocide in Kosovo were the last nonsense to be raised on these stilts. You make think it is absurd, but it IS the law, which signatories to the convention (including the US have signed)- not that the international community has followed it mind you - because, just as you find it absurd, they can just not define an action as genocide if its not in their interest to do so. During the Rwanda genocide Clinton's state department claimed that, while there were genocidal acts being committed it was not genocide. When asked by a jounalist how many genocidal acts does it take to make a genocide, the DS spokeswoman said, "I'm just not prepared to answer that. I would recommend Stepanie Power's book "A Problem from Hell: America in the age of Genocide" for a comprehensive examination of this issue. Don't you think laws should or can be written better than this one? I don't have anything against what you wrote about Sudan. However, I do think that we have to be careful about using very emotive words like 'genocide.' I think it does matter that we use important words properly, or at the very least consider how we use them, what are our motives, who exactly uses certain words to describe the actions of others, often people we are in conflict with. The essence of propaganda is to bypass our critical senses and appeal to our emotions. Often our emotions are 'irrational' and 'illogical' and that's what makes them dangerous in many situations. Here on TOD when oil executives spout-off about how much oil is left we are sceptical and critical, and rightly so. When we look at a graph or numbers we are a very precise and look at everything in detail. I just think we need to use these same critical faculties in relation to everything else connected with countries who have oil. I think how we use words is important. Language can hide as much as it can reveal. Language can illuminate and mystify. I can think of one example I was thinking of today. It's very contoversial, but illustrative of how different people use words to suit their purposes. President Bush and Condi Rice and others in the administration deny that the United States uses torture on terrorist suspects. They not only deny it, they say it is wrong to use torture, America doesn't torture, they say. Now this sounds fine and can be understood by anyone, until one begins to look at how precisely these people define the concept of torture. Here the problems start. It appears they define torture very narrowly indeed. A sadistic guard who enjoys inflicting pain and boils someone in oil or puts them on the rack, is involved in torture. This kind of 'classic torture' down in the old-fashioned torture chamber, really seems to be how they define torture. It's a pretty narrow definition and there has to be intent, or the desire to inflict pain, for its own sake too. Dave: I would strongly suggest not bowing down to commenters like smekhovo, writerman, jimvj and their likes. They do not believe genocide is taking place in Sudan. They are brainwashed like the arab countries in this matter. 300,000 people have already been killed in the sudan conflict. How many more have to be killed before it can be labelled as genocide: 3 million? 30 million? Perhaps they don't really understand the meaning of genocide or wish to be selective in their definitions. In their dictionaries, the definition of gen·o·cide (jĕn'ə-sîd') n.
The systematic and planned extermination of an entire national, racial, political, or ethnic group applicable only in areas not supported by the arab countries. Gosh, is it really so unreasonable a position to even dare to question the use of a highly emotive term 'genocide' without having to be labeled a 'arab'? What's so wrong with being an 'arab'? There are lots of different kinds of 'Arabs' after all. Not all 'Arabs' are the same. Why are so many countries against the use of the term 'genocide' in Darfur/Sudan? Let's just look at the main argument for a second. Rightly or wrongly, many countries perceive it to be a cynical 'propaganda' tool used by the American govenment to condemn a government/regime it doesn't car for. In international law the moment the United Nations says 'genocide' is being carried out in a country, lots of serious and mandatory sanctions can be applied to said country. The suspicion amoung lots of countries in Africa and the Middle East, is that the United States is merely using the term against a regime it doesn't particularly like and would like to see replaced. It's only a detail, but the United Nations, who investigated the situation in Darfur, did not characterise the conflict as 'genocide' which may or may not be relevant to anyone. AB, Why are you so anti-arab? I'm not an arab. It doesn't really support your arguments that you appear so critical of arabs. Surely one is allowed to ask critical questions without being branded? What's so wrong with arabs? There is nothing wrong with Arabs. There is much wrong with toeing the dishonest line that genocide by Arab forces, backed by Arab money is going on against Black Africans. Writerman, with all due respect, please reread George Orwell's "Politics and the English Language." Then, please look in the mirror. Whoops, omitted the crucial word "not." Here is the point: Euphemism and denial of genocide does not make it go away. How you have been sucked into supporting the blatantly false propaganda to the effect that genocide is NOT going on in Darfur I do not know and do not care to speculate on. Don, I don't understand how you can be so catagorical in your statements about Sudan and Darfur. You seem to have already made up your mind that genocide is occuring there and that it's blatantly obvious to anyone who cares to look. All I'm doing is raising a few questions about how far we should uncritically accept the US governments version of events, when they have a vested interest in portraying the regime in Sudan in the worst possible light. Surely after all the lies we were told about Iraq, our default position should be sceptism about anything we hear from Washington, anything else would appear to fly in the face of common sense and history. You do seem to have decided that 'arabs are killing Black Africans' in Darfur and nothing can disprove this fact. If this is true, why doesn't the African Union come out and condemn the regime in Sudan? You seem to think that I am supporting or making excuses for genocideæ. Why would I do this? I'm not an 'Arab.' I really don't have any interest in Sudan or any particular axe to grind in relation to what's happening in Sudan. My questions are only really concerned with 'what is actually happening in Sudan?' You seem so supremely confident that you Know what's happening in Sudan. You also oversimplify the whole question of slavery in Africa. You appear to blame the 'Arabs' once again for slavery. Slavery existed in sub-Saharan Africa before the Arabs were involved. African kings owned and captured slaves. Slavery is/was an economic catagory, not a racial catagory. This is also a very complicated subject. What concerns me is that you are so certain you're right about this issue. What exactly do you base this certainty on? I'm not so sure about what's happening in Darfur. I think it's very problematic and confusing. I think there are a lot of unanswered questions about Sudan and the civil war in Darfur. Surely the sensible attitude is to ask these questions, rather than accept as given convinient and useful stereotyping? Why do you know so much more about Sudan and Darfur than I do? What is your specific interest in Sudan? How are you so uniquely qualified to speak about Sudan with such confidence? Why do you know all the answers? At the same time what's so wrong about me asking a few questions and pointing out that there are, in fact, other perspectives on the conflict, or would you even deny that other perspectives exist? I'm afraid your voice of reason will not be heard. Perhaps we should choose some anodyne topic of conversation, like, I don't know, peak oil maybe? No reputable source disputes the evidence. I wonder how it is that you claim not to be aware of this fact. I am aware of the difference between fact and opinion. "and their likes" ... what about the likes of you? I've seen 2 ad hominems by you today. Also relevant in the resource war category is this article on how messed up Iraqi oil will be from rules being written into the government by american interests. The amazing Soj at Flogging the Simian recently did an excellent summary of all of the conflicts in Africa. Unfortunately, the list is very long. (1) Mapwise, are any bad people thinking of splitting off southern Sudan and exporting the oil via an extension of the Cameroon-Chad pipeline? Atlantic coast port would be more convenient for U.S. SUV drivers. (2) The rise of costs post-peak is usually thought of in terms of the physical cost of fidning, extracting and transporting the remaining oil. However, I suspect that the social/political/military dimension of cost will also rise. Oil-addicted nations are forced to seek oil further inland, in countries with weak governance. As prices rise, the potential spoils of controlling the central government increase. This attracts warlords and the slaughter begins. (3) Further re:Chad. The World Bank funded the pipeline (why wouldn't ExxonMobil pay for it? Too risky, my guess) with special guarantees to prevent corruption and make sure the benefits are widely shared. This important experiment has clearly failed. (4) Rice recently had her picture taken with President Obiang of Equitorial Guinea. "Obiang, a somewhat unsavory and corrupt character who seized power in a 1979 coup, runs a regime regularly condemned by the State Department for human rights violations, including torture, beatings, abuse and deaths of prisoners and suspects." Condi looks great! http://www.washingtonpost.com/wp-dyn/content/article/2006/04/16/AR2006041600737.html. Having lived in West Africa for a long time, it's always hard for me to read about the continued conflicts. I met a lot of great families there. Like most countries around the globe, African countries would like to modernize, to have better hospitals, roads, commerce, etc., especially the Sahelian countries which are much less modern than their resource rich neighbors to the south, Nigeria, Ghana, etc., that border the sea. On a lighter note, I learned so much about energy efficiency while there. Two small sticks of wood, guided by expert hands, cooked a big pot of food for dinner. Bush taxis have no schedule, only destinations. They leave when they're full. I've waited hours and more than once, days. Trust me, fuel is rarely wasted. Metals get recycled quickly, etc. If you like food, hot roadside food is the best, great combos of herbs and spice. Anyway,keep up the good work, Dave. Two small sticks of wood, guided by expert hands, cooked a big pot of food for dinner. Wow, how does that work? I was talking to an agronomist a few months back. He said that the reason for the popularity of quick stir-fries in China and of raw foods in Japan was due to the historical shortage of fuel for cooking on those countries. Mind-boggling by American standards. The idea of energy being so dear that you can't even afford to cook is beyond our comprehension. These people need solar cookers in a big way. Leanan...population densities in Mali, Chad,Niger,Sudan are not what they are in China and Japan. Deforestation is a huge problem in the Sahel as the Sahara advances and as more and more wood is used for cooking. In the U.S. we don't realize that while we can afford high oil prices, other countries can't, and that it is quite possible that future oil availability will be made on the back of demand destruction, meaning that countries with the most available cash will get the oil while poorer countries will not. While not a popular opinion, I feel that the U.S. should lead the world in automotive efficiency, if not just to bless our lifestyles then to keep the technological edge which will soon transfer to Asian countries where oil is far more dear and the imperative for efficiency far more necessary. So, in this sense cheap oil might just set us back. You can get some information on the fields here . Some background is provided by wikipedia in Chadian Sudanese conflict. A search of the page reveals that the word "oil" does not appear there. Sigh. I am dismayed, to say the least, at the dispute over my use of the word "genocide" to describe the sitation in Darfur. Some comments above come as a shock to me. How about the Turkish extermination of the Armenians in 1915? Was that a genocide? And to question what happened in Rwanda. This is beyond comprehension. I had no idea people would find my characterization of the situation in Darfur objectionable. That's my story and I'm sticking to it. I had no idea people would find my characterization of the situation in Darfur objectionable. That's my story and I'm sticking to it. That's why what you are doing is commendable. I believe what you are trying to do is write about oil. But in the context of politics and people the subjects you need to touch on can be looked at from a thousand different angles, and you never know whose toes you are going to step on. That's what makes it difficult. How you deal with that is the challenge. People have always wanted to avoid the designation "genocide" because it means they have to do something about it. Regardless of the circumstances The arguments are the same; futility: these people have been fighting each other for years ther's nothing we can to to stop it, Perversity: if we intervene we will only make things worse, or jeopardy: it is against our national interests to intervene. To this we can add another - both sides are equally guilty. The fundamental distiction as I indicated above is targeting people for who they are, not what they have done. It's precisely because of the ramifications pertaining to the use of the concept of 'genocide' that lots of people and countries are wary of using the word. If the regime in Sudan is guilty of genocide, then I believe one could argue that the Bush and Clinton administrations are equally guilty of 'genocide' in Iraq. Surely we there can't be one law for 'them' and another for 'us'? Let's agree on an independent, international investigation into the 'genocide' in Iraq and Sudan. Let Sweden or Switerland conduct the investigation and have the power to question all those involved. Dave..if the only contribution a blogger can make is to syntax and to definition, in most cases ignore him. Putting a blog subject together requires a lot of work. TOD has been a bright star in a dark sea and certainly, the premiere "free" place on the net to explore energy related topics. As a rule most bloggers at TOD seem to be truly addicted to understanding PO and to the ramifications and complications of a world living on less cheap and good quality petroleum. Keep writing! What will be interesting is when Zimbabwe's hyper-inflation reaches the point where burning the currency to cook food is more efficient than trying to exchange the money for some firewood or ancient sunshine. At this inflection point: currency value will start to equal barter value. Burning inked paper becomes much easier than the efforts of gathering and chopping firewood. Just a little bit more. The genius of this system is by Pres. Mugabe issuing ever larger, but more ever worthless denominations-- it forces the poor to deliver 'inked paper firewood and toilet paper' to the controlling rich. A single piece of paper representing a million dollar Zim value could potentially bring in a ton of ready to burn, or wipe with, conveniently sized $1 dollar Zim banknotes. I would imagine Mugabe has a big vault full of worthless small denomination bills for just this purpose. Sure beats chopping firewood WTSHTF! Just a reminder to people writing on this thread. The key word in the title is oil as it involves the Sudan, the refugees & conflict in Chad and the killing going on in these regions. Oil is now the factor which makes everything worse than it already was--which was horrific to say the least. My main point was that the intrusion of the oil factor into the region has completely destablized the situation. That is the power of oil riches--no matter how modest, and the terrible suffering that has resulted. Moreover, this situation will get worse, not better, in the foreseeable future. I commend you for posting on energy & Africa, please keep it up. For what it is worth, sometimes when I have posted African articles on the Yahoo forums: similar controversies have erupted. It is a difficult topic because of the almost incomprehensible magnitudes of death, decline, and despair gets everyone on edge. The human can be incredibly inhumane -- it unnerves us to see our true reflection.